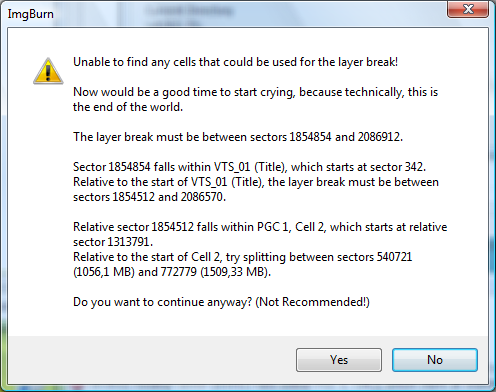 In this guide you will see how the problem with ImgBurn not being able to find any cells, that can be used for the layer-break when you want to burn a DVD DL disc, can be solved. This is an example of the window you will see in such a case. To solve the problem, we are going to use VobBlanker. If you don't already have VobBlanker installed, download it from VobBlanker's homepage. The program is free. Sector 1854854 falls within VTS_01 (Title), which starts at sector 342. Relative sector 1854512 falls within PGC 1, Cell 2, which starts at relative sector 1313791. 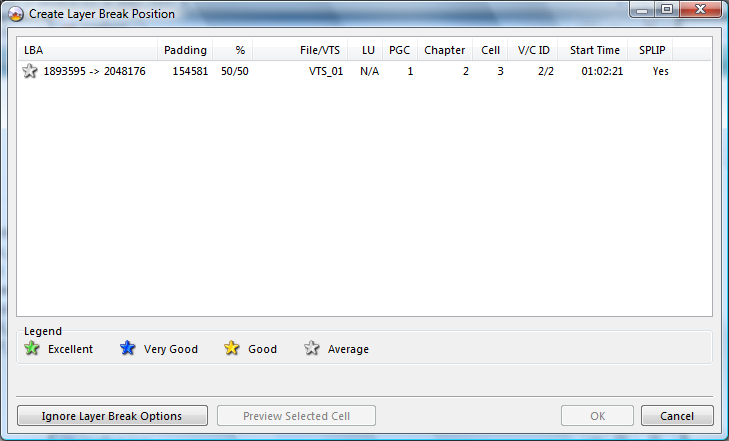 Relative to the start of Cell 2, try splitting between sectors 5400721 (1056.1 MB) and 772779 (1509,33 MB). Note: The VTS, PGC, Cell and sector values will be different in your own case. You will now see the programs main window. Press the button 'Browse' in the Input Video Manager window. Browse to your VIDEO_TS folder and select the VIDEO_TS.IFO file. Also 'check mark' the option 'Use Input Folder'. After this you should see the DVD's Title set. We know that the Title Set we are going to use is VTS_01. Click on that row and the PGC's in this Title Set will be showed. We also know that we are going to use PGC 1. Double click on the row for PGC 1 and you will see the 'Cells In Title' window. Based on the information from ImgBurn, we know that we need to split cell 2 into at least one new cell, so click on the row for Cell 2. This will bring up the 'Cell Split Mode' window. Untick the options 'Add program' and 'Add Chapter' in the 'Split Mode' options box. Play the movie by using the button 'Play' and try to find a good place for the layer break, as a set or camera change. During the play or when you move the glider (use the one in the upper left corner, not the one in the bottom of the window), you can see the current sector value in the box 'Sector (rel)'. We know that the split must be between relative sector 540721 and 772779. For fine tuning, you can use the 'Prev' or 'Next' button to select an exact frame. (Note: It is sometimes not quite possible to select an exact frame as the split needs to be made at the start of a Group of Pictures, which occur every 0.5 seconds or so). I've chosen to use relative sector 579462 as the split point. When you want to set the split point for a new cell - press the button 'Mark' and the split point will be added. You can define up to 32 split points per cell in the same VobBlanker session. Press the 'OK' button when you are done. This will bring you back to the 'Cells In Title' window. You will see the programs main window again. We are now ready to let VobBlanker process the files and create the split(s). After that VobBlanker is done, close it down by pressing the 'QUIT' button. You can now start ImgBurn and run the Build mode again. ImgBurn should now be able to find a cell that can be used for the layer-break.